NATURE CONSERVA©TION: Always look on the bright side of LIFE! Under the NAT heading, two different strands exist, which are characterized by different requirements and approaches. Under the LIFE+ Nature strand, it is possible to submit projects for the control and eradication of IAS affecting either the Natura 2000 network or species covered by the Habitats and Birds Directives. Site-related conservation measures for combating IAS can be planned both inside Natura 2000 sites (insofar as they are not recurring actions and they directly benefit the species/habitats targeted by the project) and outside Natura 2000 sites. In the latter case, such measures should be carried out on strategic spots near or adjacent to a Natura 2000 site to improve the conservation status of the species/habitats target, and to limit or prevent damage within the site. In case of species-related conservation actions for combating IAS (that are not site-related), they can be eligible insofar as they directly benefit the species of the Birds and/or Habitats Directives targeted by the project. Some special requirements must be considered in such a case. For example, applicants must provide guarantees and commitments that the investments made will be sustained in the long-term. The explanatory notes of pag.53 of the application brochure provide some additional indications on the requirements for the range of actions that can be envisaged, e.g. prevention of introductions through the prioritisation and management of pathways, establishment of early warning and rapid eradication system, and management of established IAS. The important is to show solid scientific evidence regarding the added value of the foreseen actions for the Natura 2000 sites/network, and to include an awareness raising component, particularly towards stakeholders involved in the introduction of IAS. 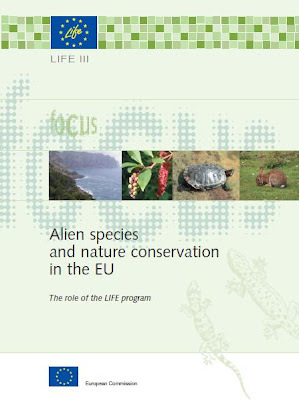 projects addressing the threats posed by IAS (1) by preventing the introduction of invasive alien species, in particular by tackling pathways of unintentional introduction, (2) by establishing an early warning and rapid response system and (3) by eradicating or controlling established invasive alien species (in line with the dedicated legislative instrument which is currently under preparation, see here). Also in this case, the explanatory notes of pag.57 of the application brochure provide some useful clarification. In fact, also such proposals should include an awareness raising component, in particular towards stakeholders involved in the potential introduction of IAS, and should have measurable biodiversity benefits as one of their main outcomes. Besides, the foreseen actions should be targeted towards the achievement of the 2020 Biodiversity Strategy. It is also possible to present projects dealing with the IAS issue within the INF heading. In relation to this Information and Communication strand, it is worth mentioning that the LIFE+ programme has developed a logical framework useful to design an effective communication campaign, likely to achieve some measurable impact on the environmental problem targeted (e.g. the impact of IAS) and on the level of awareness (about IAS and their threat), by addressing a specific target audience and gaining the support of specific stakeholders, and by monitoring such impact through specific indicators. More details are included in the LIFE+ INF 2013 Application Guide.